With the Mercedes-AMG Formula One team enjoying complete dominance in the 2014 F1 World Championship, having scored maximum points by finishing 1-2 in all of the first four rounds so far, it is a great time to soak up the exposure gained from being a partner of this high profile racing team, and with perfect timing IWC have revealed two very tasty new pieces – the Ingenieur Automatic Carbon Performance Ceramic and the Ingenieur Dual Time – which also mark the occasion of the 60th anniversary of this beautifully built, yet for some time slightly underloved line of IWC watches. Celebrating the essense of motorsports’ pioneering high tech chassis construction and underlining the Ingenieurs’ close association with high tech engineering, this years’ Ingenieur Carbon Performance Ceramic is available in a 1000 piece limited number special edition, a welcome extension from the two 100 piece predecessors of 2013, and is distinguished by the understated green dial markings and stitching detail unique to this release. 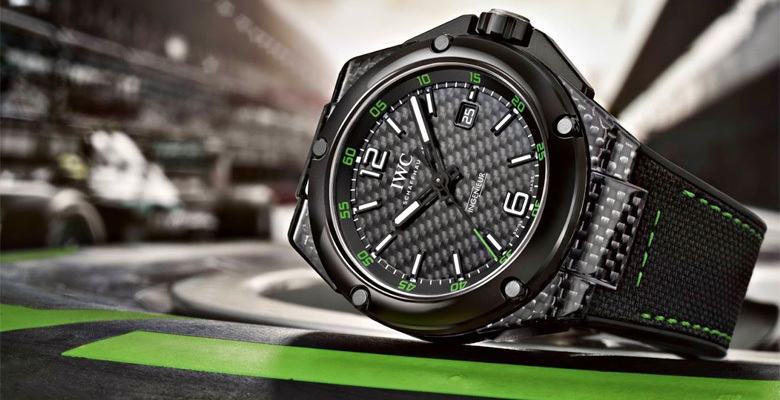 Boasting an almost naked satin finished solid carbon fibre case and dial which have been produced under the same uncompromising processes used in the construction of the Mercedes W05 Formula One cars, its distinctive weave patterning is tempered by a newly introduced mirror finished ceramic which is used to good effect for the bezel, crown and crown protecting shoulders. On the dial, the cool but spartan nature of the carbon fibre is punctuated with a date window at the 3 o’clock position, applied luminous baton hour markers and large arabic numerals at the 6 and 12. 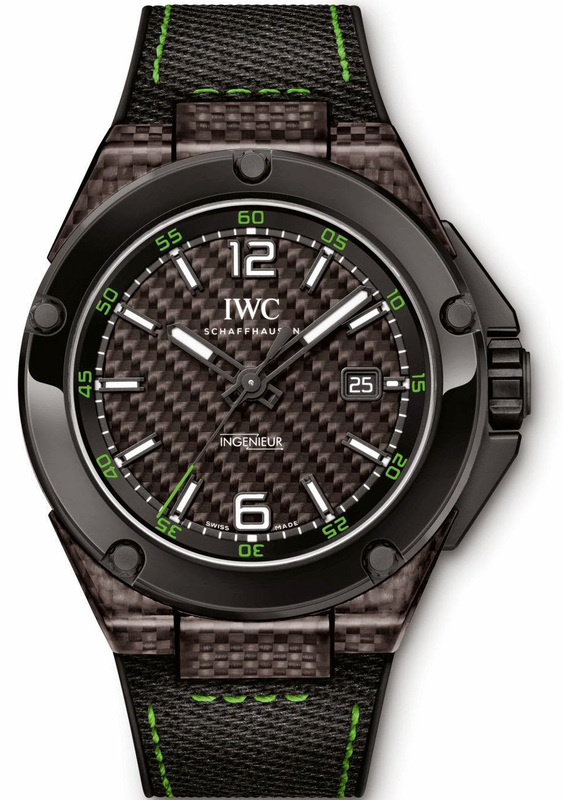 The numerals around the rehaut are printed in the same shade of green as is used on the walls of Pirellis’ wet weather F1 tyres and the subtle theme continues to the tip of the seconds hand and onwards to the stitching on the rubber and embossed calfskin strap, secured with a titanium tang buckle. 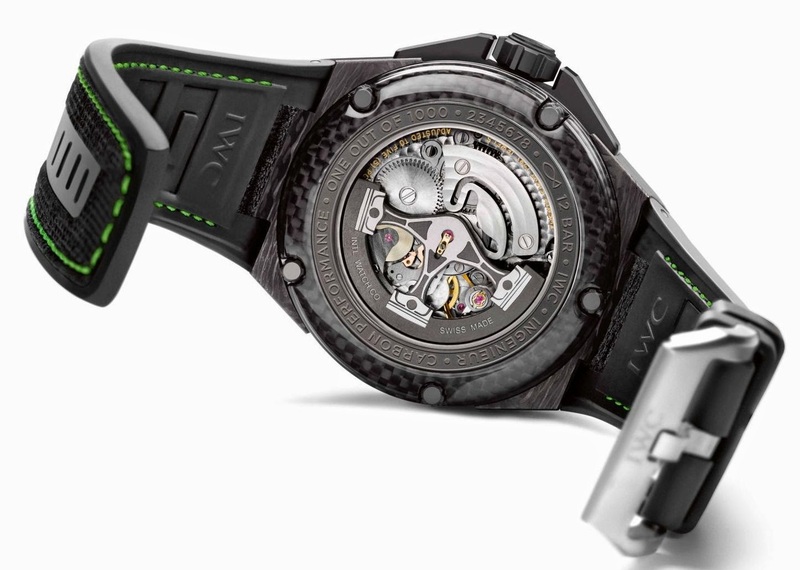 Inside the 46mm case beats the robust IWC manufacture Calibre 80110 automatic movement and through the transparent exhibition caseback the Ingenieurs’ all new oscillating weight features three splayed pistons and is one of the stand out details. Around the rear crystal a titanium ring bearing ‘One Of A Thousand’ nestles in a carbon fibre bezel through which the Ingenieurs’ signature five screws in ceramic capped titanium, pass through the case to the front, compacting the components tightly together. The current IWC Ingenieur portfolio is completed with the introduction of another new family member, the handsome Ingenieur Dual Time in stainless steel. Unrestricted in production numbers this new model will likely become a popular addition to the range. 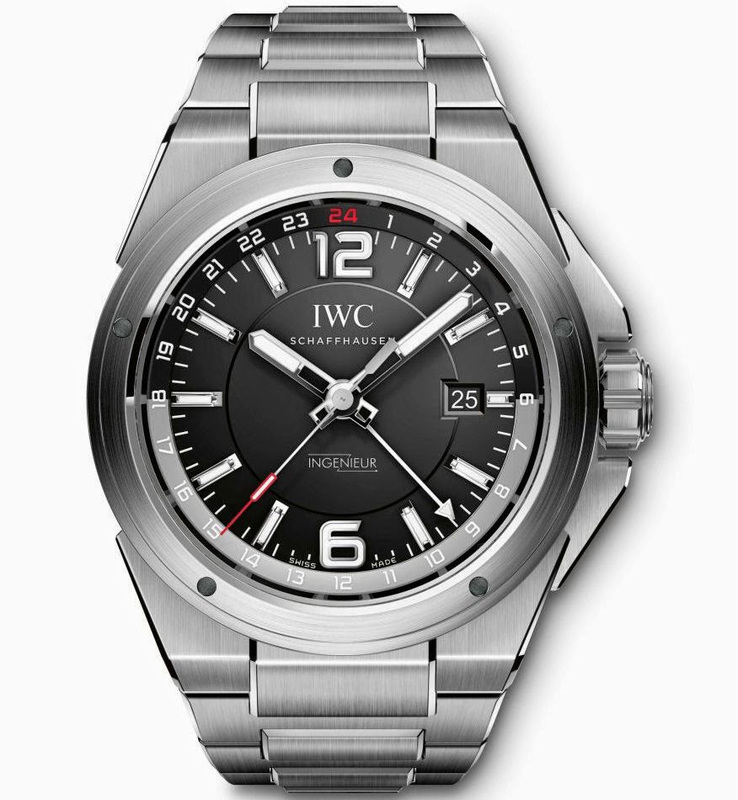 Offered in an almost modest 43mm brushed case with polished detail, and mounted on a sturdy steel link bracelet, the Dual Time features pointer-style second time zone function with a luminous arrow tip indicator and to complicate the buyers’ decision, it will be available with the options of two dial variants to choose between, both of which have their own IWC allure. 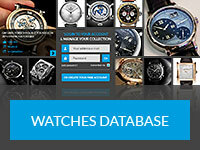 The silver plated dial option features applied hour markers and principal numerals with luminous blue fill, and its blue/grey day/night rehaut is much more pronounced than the black/grey equivalent as found on the black dial model which, with its more sober use of colour, gives it more of an air of gravitas. 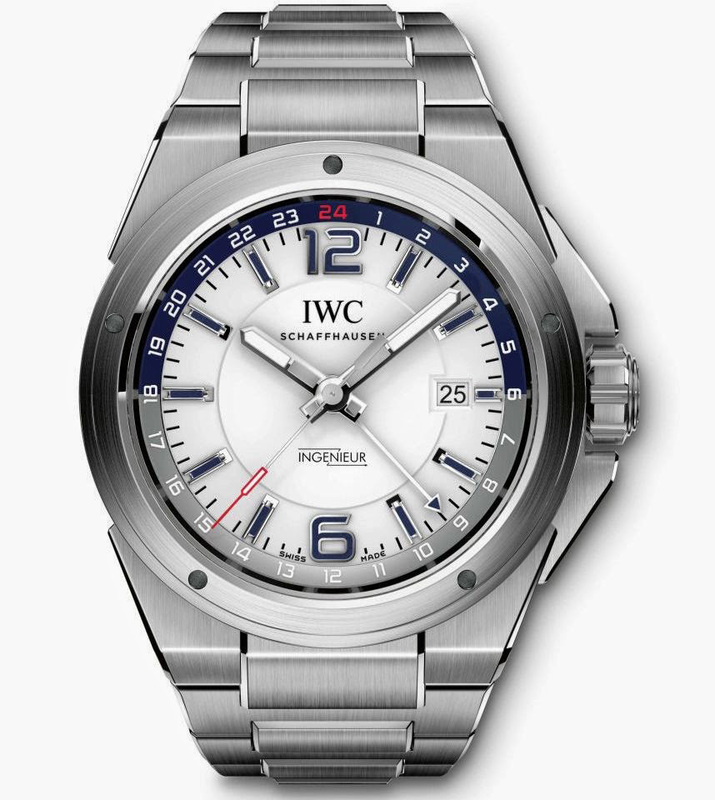 The new IWC Ingenieur Dual Time is powered by the Calibre 35720 automatic self winding movement and its properties include the ability to adjust only the hours to faciliate what IWC term as TZC (or Time Zone Correction). The Ingenieur has enjoyed a long standing association with the Mercedes AMG motorsport division, and with ambassadors like Lewis or Nico to wear them, the new Ingenieurs will surely enjoy their days in the sun and champagne as the drivers continue to step out onto the top steps of the F1 podiums around the globe this year.